Real-time marketing has been a much discussed topic in advertising lately. Therefore, it should be no surprised that when the royal baby was born, hundreds of branded congratulation tweets flooded twitter. Some tweets were good, and others were really bad. In my opinion, the Pampers tweet was the best of the bunch. It didn’t oversell and gets an A+ for engagement by asking followers to share photos of their own ‘prince’ or ‘princess’. It also works because the brand actually markets to an audience that is interested in babies and parenting. Starbucks’ tweet is fun, playful and tasteful. The only thing that bugs me is the lack of hashtag. Why bother if your tweet isn’t going to enter the conversation? 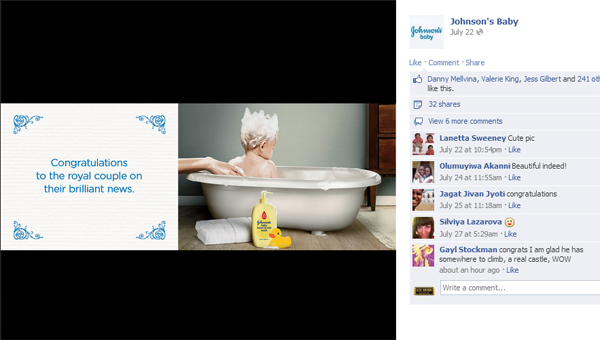 Johnson and Johnson posted this image of a baby with a crown of soap. It’s cute and subtle, while getting the message across. Additionally, the message specifically connects with their audience. 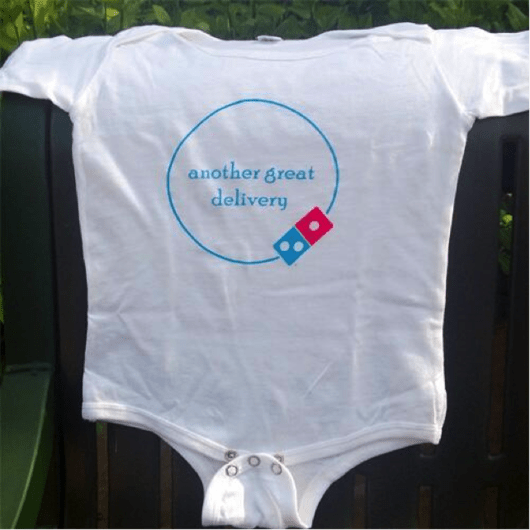 Pizza Hut tweeted a picture of a onesie after the birth was announced. I get it, they deliver pizza, but the pun fell short. It was just awkward and confusing. I don’t have much to say about this Charmin tweet. Not only is it poorly created, its also crude and lacks class. For a brand that usually pushes the envelope while remaining funny, this tweet just fell flat. This Play-Doh tweet is just creepy. Also, you’d think that the company would have someone a little more skilled at sculpting on their staff? I don’t think the real-time marketing trend will end any time soon. Brands are trying to stay relevant and work in this new space. Hopefully brands will recognize that authenticity and originality are all that is needed to connect with their audience. What do you think of the real-time trend? I’m proud to announce that the Roger Williams University National Student Advertising Team came in 2nd place in our district competition this past month! We couldn’t be more excited about placing so high in a pool of such talent advertising students. I directed a team of three other PR majors that crafted the PR & Promotions section of the plan. Read more about it below! Roger Williams University students have continued a successful run in a competitive student advertising contest, netting another second-place win for the second time in the last three years. This year, an interdisciplinary team of 25 RWU students – comprised of majors in marketing, web development, graphic design, global communication and media communication – competed in the regional round of the 2013 National Student Advertising Competition, earning the number-two seat against seven other colleges and universities from Connecticut, Massachusetts and Rhode Island. Each year, the National Student Advertising Competition, sponsored by the American Advertising Federation, enlists a corporate sponsor to provide a case study that identifies a real world problem, as well as associated campaign objectives and a campaign budget. The challenge this year was to increase awareness and consideration of Glidden Paint among current Walmart shoppers. Students conduct research to generate insights that then guide the development of an integrated communications campaign for the client, resulting in a plans book – a 20-page document similar to a written response to an RFP (Request for Proposals) that a company might send out to ad agencies soliciting ideas for a new ad campaign. Each student team then pitches its campaign to a panel of judges (comprised of advertising professionals and client representatives) through a 20-minute multimedia presentation at district competitions. Prior to the regional contest, the RWU team created print and TV ads, designed a website to test the creative ideas, and held a mock promotional event at a Walmart in Fall River, Mass. Developed through a project-based course – and one bridging so many disciplines – being competitive in this contest requires working as a well-oiled team, according to Professor of Marketing Kathy Micken. When they showed all this work in their competition presentation, they stood out among the seven other teams. Securing the second-place regional victory, the RWU team bested students from Emerson, the University of Hartford, Boston University, Quinnipiac, Salem State and Simmons. Johnson and Wales University won the competition. “Taking part in the National Student Advertising Competition was the most fulfilling experience throughout my college career. Because of the hard work and dedication we have all put into this campaign it has given me the confidence to know that I can do great things in the business world,” Consoletti added. This is the third time that the RWU team has placed in the competition: the team took fourth in 2010 and second in 2011. The Mario J. Gabelli School of Business sponsors the competition at RWU. Professors Kathy Micken and Al Cutting teach the spring semester class; Professor Steve Andrews teaches the fall advertising research class. This year’s team included Leah Barwise, Myles Bernstein, Blair Carroll, Julie Consoletti, Christine Couto, Lauren Dranoff, Samantha Edson, Caitlin Galeotti, Bailey Kolligian, Amanda Lingg, Melissa McNeillie, Rose Madden, Justin Manoni, Liz Monahan, Cameron Muir, Gina-Marie Murphy, Kyle Palmer, Becca Quigley, Kassandra Ricci, Kristen Rogers, Karly Rust, Michael Silinonte, Keri Topshe, Kirt Weiss, and Katie Wilson. Every spring the RWU communications department puts on PR career week. This week has a many events where students can network with industry professionals and learn more about the PR field. Monday, Tuesday and Wednesday have speakers that inform us about their company and provide advice on anything from class work to job searching tips. I’m a list person. I love all types of lists: shopping lists, bucket lists, top 100 movie lists…. There is one type of list that I hold very dear though: the to-do list. A typical week for me is filled with classes, projects, meetings, work shifts and time with friends. While I love my life and realize I’ve got it pretty easy, all of these things can get a little difficult to juggle without the proper organization. Google calendar may be a good friend by my to-do list is my BFF. It has taken me a while, but I have finally got the to-do list down to a science. Make it early– As soon as I am dressed and ready for the day, I write down everything that I need to do for the day. If I wait until I get to classes or my internship, I forget the important things or never get around to creating it at all. Get it all down on paper– My final to do list is usually very neat, color coded, and organized by priority. My first list is not. I write every task I need to do that day from finishing a paper to re-painting my nails. Then I decided what tasks need to be completed for the day, and prioritize the in order of importance. Color coding– Keeping my to-do list color coded helps me know which tasks go with which project. It also helps me know what is time sensitive just from glancing at the list. Stick to it!– You made the list for a reason. It’s easy to get distracted or concentrate on other tasks, but it is important to stick to the list so all the important tasks get completed. Hopefully this list helps! Happy Listing! Originally Written for the RWU PRSSA’s monthly newsletter COMMent. There were cities I visited, where I didn’t know a single word of the language. Equipped with nothing but our pocket language guides, my friends and I had to find the best way to ask directions. We ended up finding some cool opportunities, all because we took the time to figure out how to communicate with people. Public Relations is about knowing the best way to reach your target publics. Studying abroad can give you experience in learning to shape your messages and refine your body language to effectively communicate. Plus, language experience on your resume is a huge bonus! Things in a foreign country will be different, that’s half the fun of going abroad! Maybe the people are overly friendly, or you find out it cost 15 euro to sit and drink your coffee like you do at home. At first, these differences may seem nerve wracking, but adapting to the new way of life is part of the process. Learning to gracefully deal with change and embrace new situations early in life will put you ahead of colleagues. It shows future employers that you are comfortable in new environments and can interact with a diverse set of people. Leaving home to live in a foreign country is a huge chance. Its going to be scary, but its also going to be awesome. Sure, you may be terrified of heights, but jumping off that cliff and conquering your fear will be epic. Life is about choices and what we make of them. Learn to take a chance on yourself. Studying abroad can leave you with a confidence in your abilities that will impress future employers. Interested in studying abroad? Visit the Spiegel Center on the 1st floor of GHH to learn more about programs across the globe! They are currently accepting applications for the fall semester. Kassandra Ricci- PR professional and….teacher? Last semester I studied abroad in Florence, Italy. I loved learning the language and the ability to pursue my love of Renaissance art. However, my most rewarding experience came very unexpectedly. While at RWU, I typically keep a very busy schedule complete with a full course load, internship and part-time job. In Italy, my only commitment was showing up to classes four days a week. I had an incredible amount of free time and surprisingly, I didn’t really like it. When the secretary mentioned that a local elementary school was looking for a tutor, I figured I would give a few hours of time to help a student learn English. Apparently, tutor meant teaching English to an entire class of 15 or more students. At first, I was overwhelmed and a little wary of my elementary Italian skills. 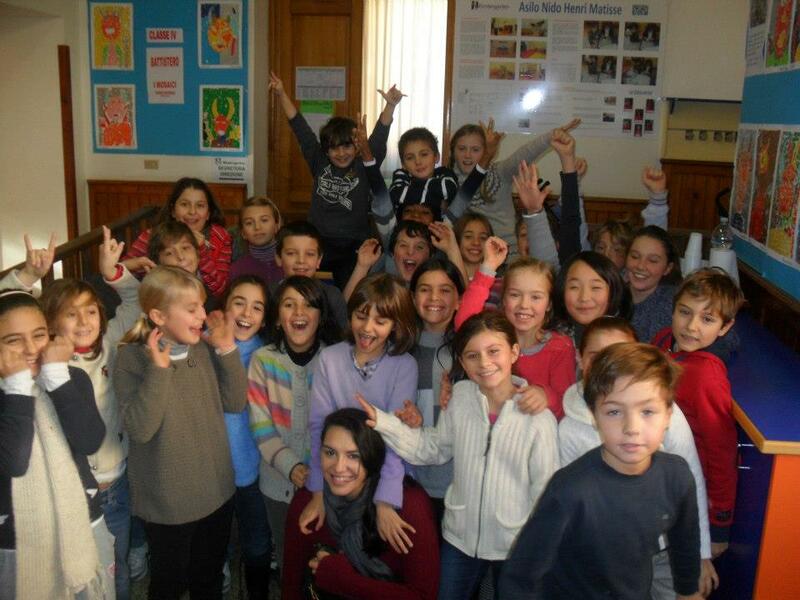 However, the enthusiasm of the children was infectious and I began enjoying my time spent at the school every week. While I was teaching a lesson on asking for directions, it hit me that they were teaching me too. As they said the phrases in Italian and then in English, I realized the Italian words no longer sounded foreign to me. Without realizing it, we had switched roles. I was meant to teach them about the United States and English, but they ended up not only teaching me about their culture but also accepting me into it. I’m so grateful for having the opportunity to have worked with the class. I hope that they learned as much from me as I did from them! Want to learn more about my study abroad experience? Read my blog to hear all about my adventures. Writing is a skill that many struggle with, especially as students. However, good writing skills are crucial to success as a PR professional. Personally, I agree with Hemmingway; writing is a skill that can always be improved. 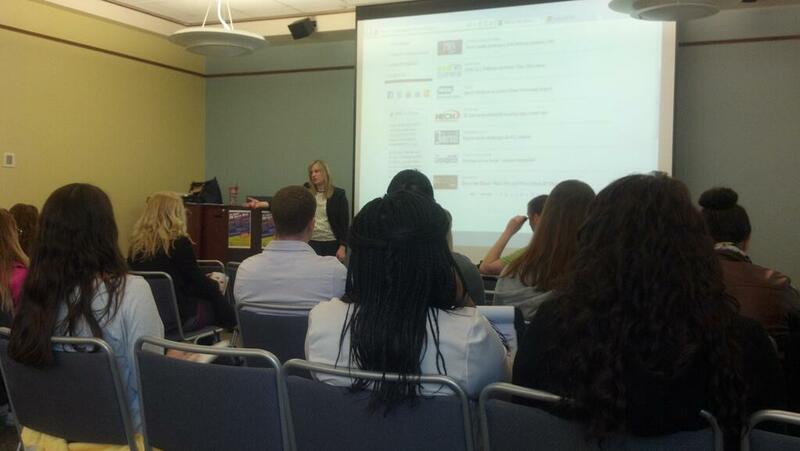 Last week PRSSA held a #PRSSA chat focused on writing skills. It highlighted several key points about writing for an audience and sticking to style guide outlines. Many of the tips from professionals and students alike, urged bloggers to make sure their blog writing had personality. Amy Bishop (@AmyL_Bishop), Digital Marketing Manager at Cru Global, stressed the importance of making sure that your writing style reflects the way you want to be perceived. If you are writing a professional blog, make sure that all content is spell-checked and doesn’t have any glaring grammar mistakes. However, your professional blog doesn’t have to be boring! Write about what you love, but do it in a way that shows the reader your skills and strengths. Did you know there was a PRSSA Style Guide? It is full of tips and tricks for PRSSA chapters to use in their communication with members and national. It will come in handy when we have to send news releases and RWU communication for Jolly Roger Public Relations. Want to add to your portfolio by writing for PRSSA’s Progressions blog? First, make sure to check the style guide for special PRSSA punctuation and titles. To learn more and participate in the next chat follow @PRSSANational. Mashable recently posted about the use of social media and how it is changing the fashion industry. They shared an awesome infographic that gives all the social media states of NYFW. that Social media interaction during New York Fashion week doubled this year. Brands and designers are taking the time to interact with their audience on these social platforms. In fact, over 650,000 tweets were posted from brands throughout the week. How is this changing the fashion industry? I actually asked this question before and I’m fascinated by how much has changed since I wrote that post. Social media is completely changing the role of the average consumer. Suddenly the everyday consumer can virtually sit in the seat of a fashion editor and fashion opinion leaders can now be the average person with a large twitter reach.Companies who are embracing the new social structure are quickly gaining strong followings of various sites. Specifically, Pinterest was creatively used by designers to preview their brands and to display looks after the runway show. Many brands doubled their Pinterest followers throughout the week. Its interesting to see how much has changed since the last time I explored this issue and I’m excited to see the future developments of social media in the fashion industry. Even journalists are doing it!